As we continue year-end planning discussions, many of our clients are showing great interest in using a qualified charitable distribution (QCD) to satisfy their charitable goals. In our recent communication, Year-End Planning Under a Changing Tax Code, we discussed the qualified charitable distribution (QCD) strategy for individual retirement accounts (IRAs). In this communication, we outline some of the rules that must be followed for a distribution to qualify as a QCD and revisit the benefits of this strategy. A QCD is a transfer of funds from an IRA payable directly to a qualified charity. These distributions can be counted toward the satisfaction of a required minimum distribution (RMD) if certain rules are followed. While a QCD can count toward the required minimum distribution (RMD), the funds must come out of the account before December 31st. Our custodians offer clients the option to have a checkbook tied to their IRA. It is important that any charities receiving these checks deposit them before December 31st, otherwise the distribution may not count toward the current year’s RMD. The maximum annual amount for a QCD is $100,000. This limitation applies to the sum of QCDs for each taxpayer. A married couple can distribute $200,000 in total, if the $100,000 limit is not exceeded for each spouse. The IRA owner must be age 70 ½ or older to be eligible for a QCD. The RMD rules begin in the year the account holder reaches age 70 ½, however they cannot take advantage of the QCD until the date they reach age 70 ½. For example, a taxpayer with a birthday on April 1st will reach age 70 ½ on October 1st and can only make a QCD after October 1st. Only IRAs are eligible for the QCD. Employer sponsored plans such as 401(k)s and 403(b)s are not eligible. If a client with one of these plans wishes to take advantage of the QCD, they will need to roll the funds over to an IRA before they will be eligible. Note that if they wish to take advantage of the QCD in 2019, the rollover will need to occur before the end of 2018. A qualified charity is defined as a 501(c)(3) organization. Charities that do not qualify for a QCD include donor advised funds, private foundations, and supporting organizations (charities carrying out exempt purposes by supporting other tax-exempt organizations). IRA distributions are reported to the account holder on IRS Form 1099-R. The custodians issuing these tax forms will not distinguish between normal distributions and distributions to charity. The reporting burden falls on the taxpayer to indicate on their tax return how much of the distribution qualifies as a QCD. A QCD must meet the same substantiation requirements as other charitable gifts, including a contemporaneous written acknowledgment from the charity for gifts valued over $250. Distributing the funds directly from the IRA to charity reduces the income reported on the account holder’s tax return. 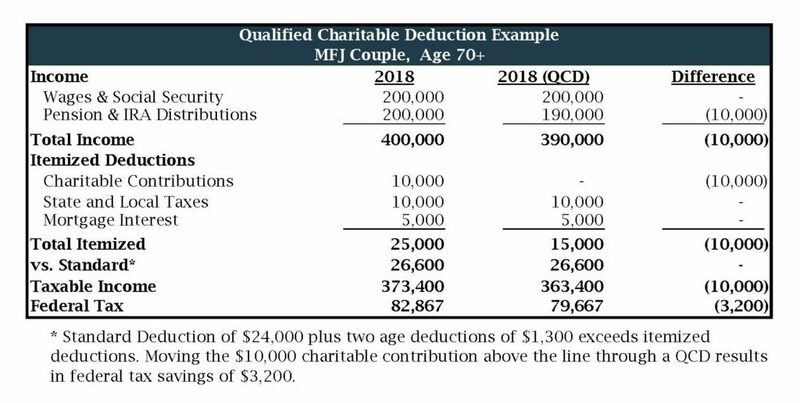 The distribution does not also qualify as an itemized deduction, however given the increase in the standard deduction, many of our clients have found that a QCD is more beneficial than an itemized deduction (see example below). In addition, reducing adjusted gross income may help to keep you below certain thresholds including the threshold for Medicare Surtax and modified adjusted gross income (MAGI) for the calculation of Medicare premiums. If you are not eligible for a QCD and are still interested in how to maximize your charitable deductions, check out our previous discussion on bunching. If you would like to discuss either of these strategies or the rules associated with QCDs, please contact us.